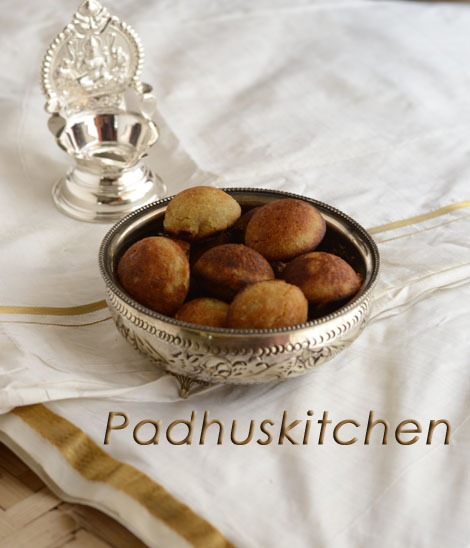 Unni appam is a popular snack in Kerala prepared from rice, jaggery, banana and ghee.Today I am going to share with you 2 methods of preparing unniappams. One which I learnt from my friend and another is an instant version which I got it from a magazine. I have tried and tested both methods. Personally I liked the outcome of the first method but I am sharing with you the other method also (instant version) as it might come handy when you do not have much time for the elaborate method. Today we will learn how to prepare unniappam following our easy recipes. Wash and soak rice overnight or for 5-6 hours. Fry coconut bits in a little ghee and keep it aside. Add cardamom powder, sesame seeds, fried coconut bits, cooking soda and mix well. The consistency of the batter should not be too thin nor too thick, so adjust accordingly. Heat a paniyaram pan, add a tsp of oil + 1/2 tsp of ghee in each hole of the appa chatti or paniyaram pan. When the oil + ghee becomes hot, reduce the flame to low and fill the holes with the batter. (fill only up to 3/4 th of the hole). Now cook covered in medium flame. When the bottom starts browning, flip it over to the other side with a spoon or a skewer. Let the other side get cooked uncovered until golden brown. Once cooked, remove and drain on a kitchen towel. Note- You will get soft unniyappams only if rice is soaked for so long and fermented. Fry coconut bits in 2 tsp of ghee and keep it aside. Heat 1/4 cup of water and dissolve jaggery in it. Filter it to remove impurities.Keep this ready. In a bowl, mix together rice flour and wheat flour. Add chopped banana to it and mash it well. Add warm jaggery to the above mixture. Then add fried coconut bits, cardamom powder,cooking soda and mix well.This is the unniyappam batter. Follow the same method as given in the first recipe for preparing unniappams. Wishing you all A Very Happy Vishu. Love this one.. Great take aways when u leave town for a long while..
hi should i grind the rice, banana & jaggery together n leave it for fermentation or i will grinding the rice n jaggery together n add banana only before frying unniappams? Can i use palm jaggery (Karupetti) instead of jaggery?? Anitha -For the first method -Grind rice alone and leave it for fermentation, then add jaggery, banana and other ingredients at the time of making unniappams. You can add palm jaggery though I have not tried it. They look great! Do they need refrigeration or can they be kept outside for a couple of days? Yes, they can be kept outside for a day or two - not more than that.